Sephora’s loyalty program has been heralded as a loyalty program phenomenon since its launch in 2007. It’s regularly celebrated by retailers everywhere for its attention to the customer experience, desired rewards and longevity. With the new year came a huge overhaul for the rewards program. Allegra Stanley, Vice President of Loyalty for Sephora, stated, “Our aim is to continuously adapt and grow our [loyalty] program as clients’ needs and wants evolve.” She then went on to explain how this year’s changes are part of a multi-year journey that seeks to constantly raise the bar. Sephora’s loyalty program gives customers added value beyond discounts. Members are given the opportunity to engage with their favourite brands in a way that’s only available at Sephora. While the variety of “trial-sized” products and one-of-a-kind experiences (such as full-face makeovers) gives customers more, tangible benefits in exchange for their loyalty. Sephora also uses their loyalty program to build emotional connections between shoppers so they feel like part of a wider collective. 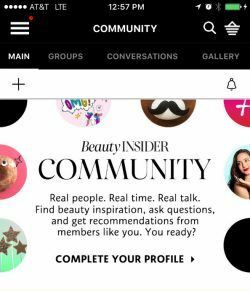 The Beauty Insider Community is a safe space where like-minded beauty lovers can find inspiration, ask questions and get unsponsored “real talk” from others just like them. 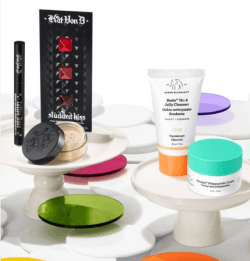 Finally, Sephora makes clever use of tiers. By having different levels of membership, with unique perks tied to each, members have something to aspire to. To reach the higher tiers, members will spend more to get the exclusive rewards – a win-win situation for both Sephora and their members. The combination of these key features makes Sephora’s Beauty Insider program a trailblazer in the cosmetics industry. But what changes are afoot this year and how can you adjust your loyalty program to match up? This year, Sephora is surprising members across all tiers with birthday gifts. This includes mini sets from notorious brands such as Kat Von D and Drunk Elephant. These added perks give shoppers an incentive to join the loyalty program right away as they can see instant benefits. Take inspiration from Sephora and give your loyalty program members a free gift or extra points on their birthday. They’ll see the immediate value of joining your loyalty program. Then, once their birthday comes around, they’ll get a pleasant surprise and will feel like you appreciate them on a personal level. For 2019, Sephora is revisiting and improving their tier based system. They’re giving members at higher tiers more choices to choose from for their birthday surprise – either a rotating gift that changes monthly or an extra 250 points. This new perk gives customers another reason to aspire to move up to the next tier. With this goal in mind, customers will be more likely to increase their basket size and spend more regularly to meet the criteria. Try implementing a tiered based system in your loyalty program. Be sure to correlate exclusive rewards with each tier that are not accessible at lower levels. And, just like Sephora’s members, your customers will be incentivised to move up tiers when they see there are premium benefits to unlock. 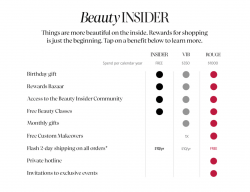 Sephora’s updates this year also allow current and future VIB and Rouge members to personalise their program perk options. They can pick one of three benefits for the year, such as extra points, sharing makeover experiences with a friend or quick shipping. By allowing members to choose their perks, they’re ensuring that their loyalty program is flexible and adaptable to each member’s needs. This level of personalisation also empowers customers to take control of their loyalty program to make it something that gives them real, personal benefits. No matter who you are, using personalisation and your loyalty program together is a recipe for success. Try using data from your loyalty program to learn about your customer’s likes and dislikes. With this insight, you can send personalised loyalty emails to attract shoppers back to your store. These could show related products to previous purchases, and the points they would rack up if they buy them. Or, they could communicate your customers’ existing point balance, and the benefits they’re missing out on by not spending them. You could also take a page out of Sephora’s book and use your loyalty program to gift loyal customers with exclusive experiences – such as live gigs or product launches. These experiences will create a buzz around your brand and your attendees will be excited to share the big event with friends and family. This way, your loyal customers naturally become your brand advocates as they’re sharing their positive experiences with your store. While other department stores like Kohl’s and Macy’s have tried to refresh their loyalty programs this year, it’s clear that Sephora continues to shine as the best in class. Why? Because they continue to transform and adjust their loyalty program to suit the needs of their customer base. Take inspiration from Sephora this year and who knows, maybe your loyalty program will be the next best thing in the loyalty space.